November | 2011 | How to love Igbo things (or what you will). Err…yeah. So, turns out I can write 50,000 words in a month. And so what if my family has only been eating Indomie for a whole month? It’s all about the big picture! The show’s not over till the fat lady sings….so, keep reading. And thanks for your support! Even before Lucy figured out she was an only child, she knew she preferred her life to that of her friends. She didn’t have many friends; they always seemed too grasping somehow, but the ones she did have from time to time seemed doomed to sharing all aspects of their lives with someone else; their time, space, clothes …even their surnames. Lucy liked to give things to people, but she didn’t like to share what was hers. The first person who tried to make her that she remembered was her teacher in Primary two. A new pupil had joined the class and didn’t have a pencil. The teacher had asked Lucy to hand over one of hers which she would get back at the end of the day. “Why?” asked Lucy. She kept a firm grip on her red velvet pencil case shaped like a big pencil with her name ‘Lucy’ spelled out in bits of bright green felt. The fake eraser on the case sported a big zip which went right round. It felt cool pressed against the throbbing hollow in her throat. “Com’on bring out one pencil and give her, osiso. All you children of rich parents are so selfish. You never like to help the less fortunate. Why can’t you just spare one?” Lucy looked at the hands of the teacher stabbing the air in front of her. She could see the collarbones sticking out through her dress. 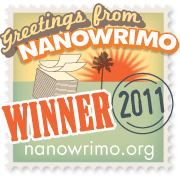 Click here to access the novel I am writing for NaNoWriMo.